All I heard was that this place has some of the most beautiful sunset and sunrise in the world. Little did I realize it wasn’t just the sunset/ the sunrise, everything here just felt so surreal, and made me feel so warm and fulfilled on the inside. 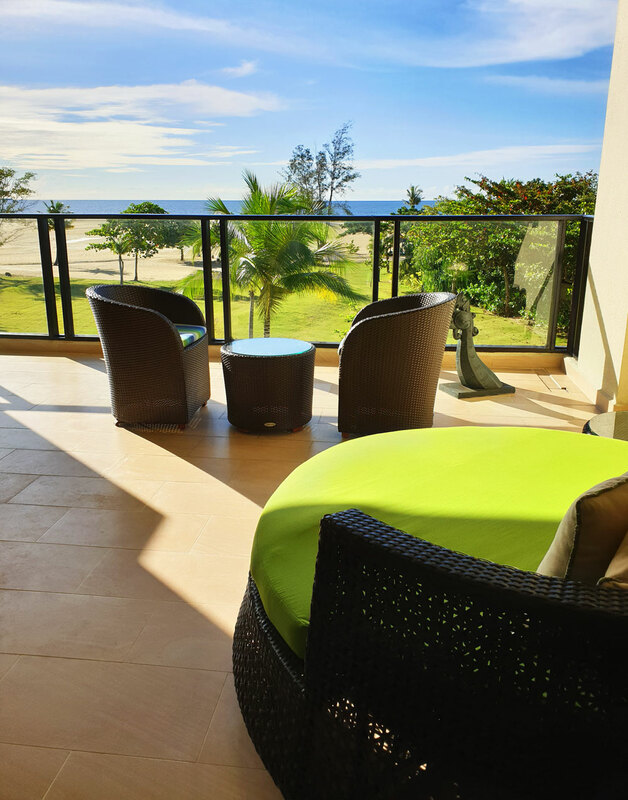 The Beauty of Rasa Ria couldn’t be just put into words and pictures. It had to be felt from the heart. Can there be a place so pristine? I mean you all know how much I love Malaysia, I have been going on and on about it since my visit earlier this year. If I had to choose only one country to visit for a lifetime, that is Malaysia for me. And, if you can make it to Malaysian Borneo, please do not miss this Shangri-La. IT is just brilliant! We drove directly from the airport to the resort. It took us a good 50 minutes to arrive at the hotel. The moment you arrive you are welcomed with acres of sprawling greenery and scenery that there is a whole sense of fulfillment of just arriving there that takes away your tiredness. We were welcomed to the hotel by Cynthia at the Ocean Wing Lobby. We arrived at the hotel around 3 pm in the afternoon, and headed to our room almost immediately after. While we were at the room, we were welcome with a refreshing lemon drink and cold towel. We eased into our room and settled in, but I couldn’t just not stop staring at the sky. The number of times it changed colors during the 1 hour before we headed out was unreal. There were local snacks already waiting for us in the room - several kinds along with some local fruits. We headed for horse riding a little before sunset hoping that we would be witnessing sunset soon after calmly. Somehow, it happened to be a little different from the plan. 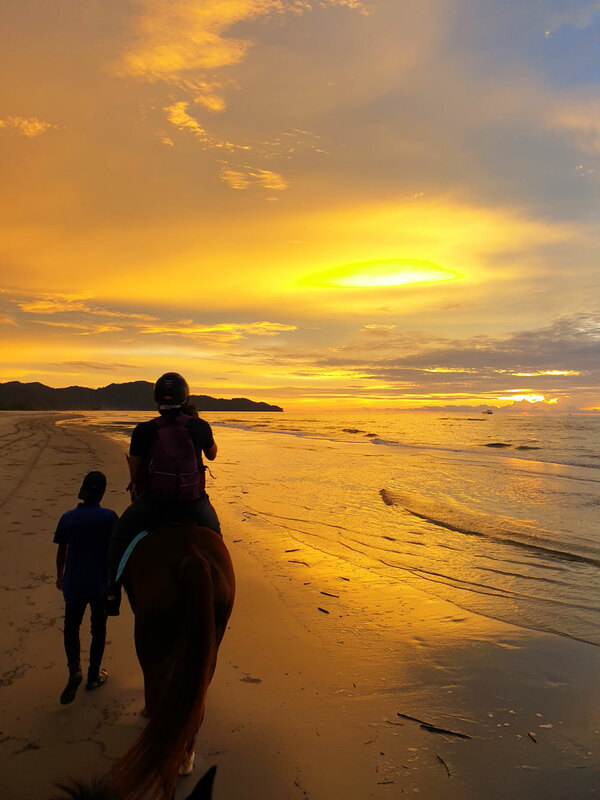 We ended up watching the sunset riding a horse on the beach. My first time ever on a horse that huge. Absolutely fell in love with the horse even though I was very scared. Somehow as I write this, I am thinking that I did have a bond with the horse. I miss it now! My horse’s name was Jeff - Black Beauty! The sunset at Rasa Ria was unbelievable. From every angle, it looked different, and brilliant, and beautiful. We didn’t know whether to look towards the sea or the reserve. By the time we were done horse riding, the sun was down. We walked barefoot on the sands to get some drinks. The sand is divine. I don’t think you understand what I am talking about. But, it is divine. It felt like a spa of its own kind. We talked over Pandan Coconut and Tender Coconut. We learnt about a band who was playing there - 3 men. Two of them a little aged, and the third one was the son of one of them. The two aged performer used to be together in the band during their young days, and the reserve somehow reunited them and brought them together. We then headed for dinner at Coffee Terrace where there were cultural perfomances put together to depict the cultures of the different tribes in Sabah. The perfomances were interactive and some of them were really unique and intriguing. One of them which particularly stood out was the bamboo dance. We shared our dinner with the hotel’s marketing team where we learnt more on the hotel’s commitment to support environment conservation, social issues and health issues amongst others. As part of conservation, water is stored in glass bottles in the room. Nests hae been built into the hotel buildings in between balconies. We went back after dinner to a bubble bath arranged for us in our suite. We were prepared to wake up to go trekking in the morning through the Rasa Ria Reserve. However, due to rains in the night, the trek was cancelled. We prayed that we would be able to do it the next day before we left, and hopefully no rains. We didn’t sleep in since we were already up, and decided to just see the beauty of the sky from our balcony. We headed off for breakfast. The selection was huge - some of the fascinating things that caught our eyes at the buffet were the yellow watermelon and the snake fruit. I did try the watermelon. It tastes very similar to the normal one. The snake fruit, I couldn’t try it as the name put me off. We opted to sit outside where the view was just stunning. Just while we were having food, we saw over 15 different kind of birds - all unique and stunning. After which we took a stroll to the beach. The sea was a bit rough. The time we were there was around when they were getting ready for their monsoons. And, so the sea was mostly rough, and dark clouds kept making an appearance from time to time. We then headed to explore the stunning Dalit Bay Golf and Country Club. It is an 18 hole golf course. IF you choose to play there, hole 11 has the best view there of the Mount Kinabalu. The golf course was just a serene place to be that I didn’t want to return back to the room. They say the golf course is a great place to be if you are into bird watching as well. We got back to our room a little before sunset hoping to make it to the beach just in time. We didn’t get a sunset as it rained exactly around time. So, I was very grateful for the sunset we got to witness on the first day. We were getting very close to our departure time. We prayed and kept our fingers crossed hoping that it wouldn’t rain overnight and that we could do the trek in the morning before our departure. We went to sleep early, and were up early. Thankfully, it hadn’t rained and we were going trekking to see the sunrise over Mount Kinabalu and have a light breakfast there. The walk wasn’t very hard. It did have me grasping for air and going out of breath but it didn’t take too long to reach the top. Since, it had rained the day before, the forest was cool, and that made the trek a little more easier. We made it to the top, and it surely was one stunning sunrise. Although according to our guide, there were better sunrises, I couldn’t complain as the view was just spectacular. 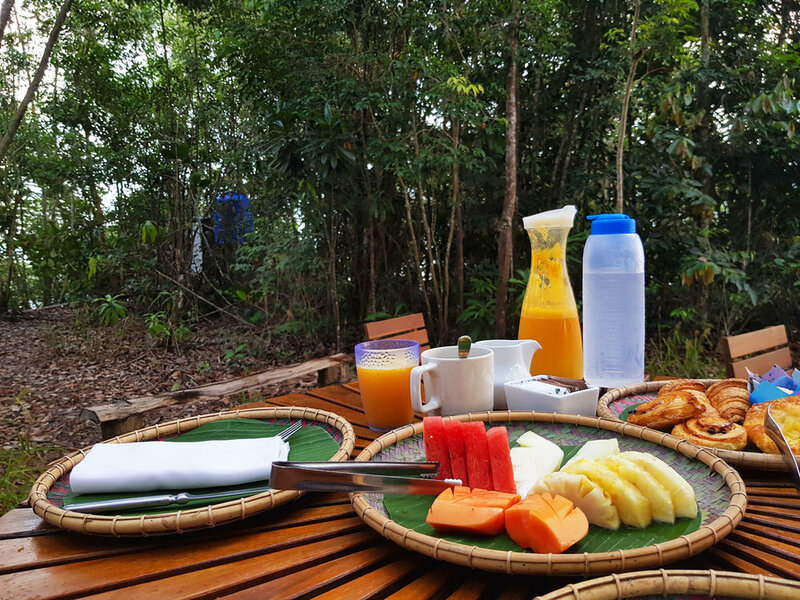 We had a light breakfast very thoughtfully setup by the hotel, enjoyed the view a bit more, learnt about the forest. Before our trek came to an end, I was given a jackfruit sapling to plant. Hopefully it grows into a tree by the time one of you make it there or I get back there myself. Before we knew, our time at this beautiful place had come to an end. Our farewell at the resort almost got us teary eyed as they sang us the Rasa Ria goodbye song. I think this has been my most favorite goodbye to date. The Shangri-La Rasa Ria Resort spreads over a huge area, and two days aren’t just enough to experience the property. The resort has two wings - the Ocean Wing and the Garden wing. Oceano is your go-to place for Italian recipes. Have you been to Sabah yet or are you thinking of going? Let me know if you do make it there in comments. Disclaimer: This post was done in collaboration with Shangri-La Rasa Ria. However, all pictures and opinions are my own.